PokerStars will acquire Full Tilt as part of the settlement. 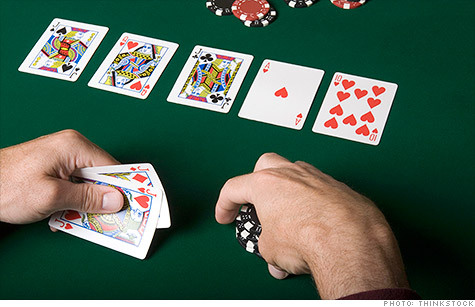 NEW YORK (CNNMoney) -- The Department of Justice announced a $731 million settlement Tuesday with online poker companies PokerStars and Full Tilt Poker to resolve bank fraud and money laundering allegations. Full Tilt also resolved allegations that it operated a Ponzi scheme, failing to maintain sufficient funds on deposit for players to withdraw. Prosecutors said last year that Full Tilt had used more than $400 million worth of player funds to pay board members and other owners since 2007. As part of Tuesday's settlement, Full Tilt will forfeit to the government virtually all of its assets, which will then be acquired by PokerStars. PokerStars will repay the approximately $184 million owed by Full Tilt to foreign players. Full Tilt's U.S. victims can seek compensation from the $547 million forfeited by PokerStars to the government. In April of last year, the government accused Full Tilt, PokerStars and Absolute Poker of circumventing federal laws against Internet gambling by deceiving banks and credit card issuers into processing payments for U.S. players. The companies allegedly arranged for money from U.S. gamblers to be disguised as payments to hundreds of non-existent online merchants for items like jewelry and golf balls. A settlement is pending with Absolute Poker that would require the company to forfeit all of its assets. A lawyer for Absolute Poker did not immediately respond to a request for comment. None of the companies admitted wrongdoing as part of their agreements. PokerStars chairman Mark Scheinberg said in a statement that the company was "delighted we have been able to put this matter behind us," and looked forward to operating in the United States when it is legal to do so. In the meantime, PokerStars remains open to non-U.S. players. Ex-Full Tilt CEO Raymond Bitar, who was arrested earlier this month in connection with the case, said in a statement that he was "extremely pleased and excited" at the prospect of Full Tilt customers being repaid. Eleven people in total have been charged criminally in connection with the case. Seven have been arrested, all of whom have pleaded guilty save Bitar, while four remain at large. In addition, poker celebrities Howard Lederer and Chris Ferguson, former Full Tilt board members, face civil charges.